North Zone: North of Nuevo Vallarta / Flamingos there are several small towns snuggled along the coastline of Banderas Bay to include Bucerias, La Cruz de Huanacaxtle, Punta de Mita and Sayulita. Collectively, this area comprises what many refer to as the North Zone or Zona Norte. Along the north shore of Banderas Bay lies Bucerias, “place of divers,” which is a name given to this area because of the divers who once harvested oysters here. Bucerias is a charming, vibrant Mexican town with an old-world feel. A mixture of cobblestone streets along with paved and dirt roads cross this lovely town. 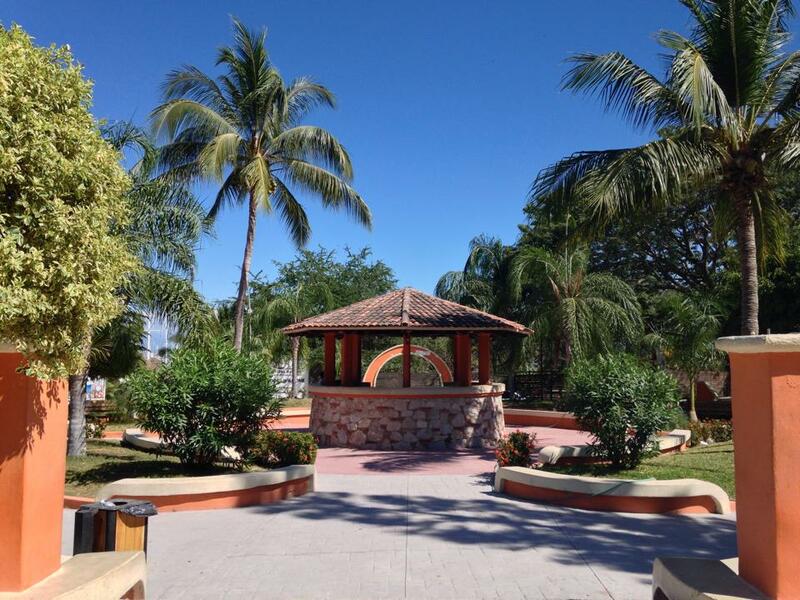 Bucerias has a beautiful church, and a very picturesque town square that faces the ocean. It’s large open-air flea market with a variety of sculptural art and colorful hand-made artisan offerings is a big draw for visitors to Bucerias. Pedestrians approaching the Bucerias Flea Market from the south will cross a bridge over the river and through a very sweet and unique passageway: Paseo Del Beso. 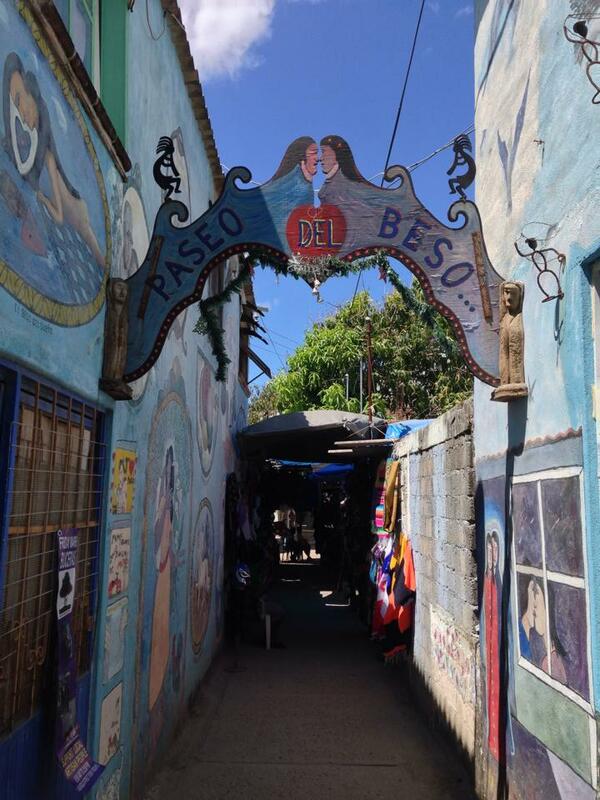 This “Alley of the Kiss” connects center of town with the romantic zone of Bucerias. Visitor’s Tip: When shopping at the Bucerias Flea Market, many of the artisan items offered are the very same ones available at the flea markets in Puerto Vallarta. But with a little negotiation with the vendors you can often get them here in Bucerias for much better prices than in Puerto Vallarta. This fun and lively town is home to an impressive number of gourmet restaurants, as well as many taco stands, small beachfront eateries and bars. Throughout town there are several venues for live music and live theater performances to include The Drunken Duck, Luna Lounge, Sonora a la Parrilla Steakhouse, and many more. With friendly locals at every turn and affordable accommodations for travelers, Bucerias is a favored spot for both tourists and expats alike. Conveniently located just 25 minutes north of Puerto Vallarta, and directly adjacent to Nuevo Vallarta / Flamingos, Bucerias has all of the tourist amenities international vacationers come to expect, as well as an appealing 8-mile stretch of soft sandy beach. The specific section of Flamingos Beach running parallel to the town is often referred to as Playa Bucerias. In addition to plenty of hotel and rental condo accommodations as well as a hostel, there is one large all-inclusive resort in Bucerias: The Royal Decameron Complex at the south end of town. Two miles from Bucerias heading north-west toward Punta Mita is the residential and nautical town of La Cruz de Huanacaxtle. Many locals refer to the town simply as “La Cruz.” Although many of its original and established homes are modest and humble, ongoing construction and development within the entire area has more recently resulted in a series of modern and luxurious condo complexes, along with a variety of new restaurants and amenities, to spring up in this quiet, tucked-away section of Banderas Bay. While the lovely south end of the beach at La Cruz is more tranquil and uncrowded, the nice and lively northern section of the beach is frequented more heavily by locals and tourists alike, with an especially upbeat and vibrant scene on weekends and holidays where the beach layout can often be umbrella to umbrella, towel to towel. An important highlight of La Cruz is that it’s home to the expansive and ultra-modern Marina Riviera Nayarit which boasts 351 boat docks which range in length from 31 to 400 feet, a yacht club, restaurant, sky bar and spa. Locals, tourists, and restaurant chefs from all over the Puerto Vallarta area frequent the daily fish market at La Cruz, arriving early in the morning to select the very best catch-of-the-day offerings. Tourists will find delight in the fact that local businesses in La Cruz are unpretentious, and their merchants extremely gracious. Another nice feature of La Cruz is that the town is small enough for both tourists and residents to easily to get around on foot. At the northern-most tip of Banderas Bay is the incredibly magnificent Peninsula of Punta de Mita which houses the town of Punta de Mita. (Just to clarify: The Peninsula is named Punta de Mita, the town itself is named Punta de Mita, but there is also a private residential community built there which is named Punta Mita. And if you’re not confused yet, when locals refer to this town they often drop the “de” in the middle of its name and just say Punta Mita.) Located just a bit further down the coastline from La Cruz, this ultra-exclusive area boasts lavish beachfront villas, prime real estate opportunities for investors, and luxurious resort hotels such as the Four Seasons Resort, Punta Mita with it’s world-class golf course. An interesting fact: In 2014 Microsoft co-founder Bill Gates purchased the Four Seasons Resort complex and 48 adjacent acres of land for $200 million USD, but the resort will continue to be operated by Four Seasons Hotels and Resorts. Around Punta Mita there are several stunning, secluded beaches that are only accessible by boat or car. Punta de Mita is a perfect getaway for those individuals and families who are looking for a quiet, tranquil retreat away from the noisy buzz of city life. International surfers are also drawn to this location, specifically Punta Mita Point and Sayulita, which is an area referred to as the Mexican Malibu due to its seven surf swells. Every year Punta de Mita is frequented by many international celebrities and their families looking for a serene beach vacation with world-class accommodations situated in a lush tropical environment. Punta Mita is just a 45-minute drive from Puerto Vallarta’s international airport (PVR). Just a bit farther north around the bend from Punta de Mita Point, and leaving Banderas Bay behind, is the colorful and vibrant Bohemian surf town of Sayulita. Located just 45 minutes north of Puerto Vallarta, getting to this enchanting destination is a very easy drive down modern well-paved highways. With dogs and chickens roaming freely along its cobblestone streets, vivid-color homes with unique architecture, it’s rural tropical ambiance intermixes with a very laid-back, hippie vibe. Locals and visitors are a combination of artists, musicians, surfers, fishermen, and young people from all over the globe. There are a huge number of cute little shops with unique offerings, an abundance of restaurants and small eateries, and a very sweet town square. 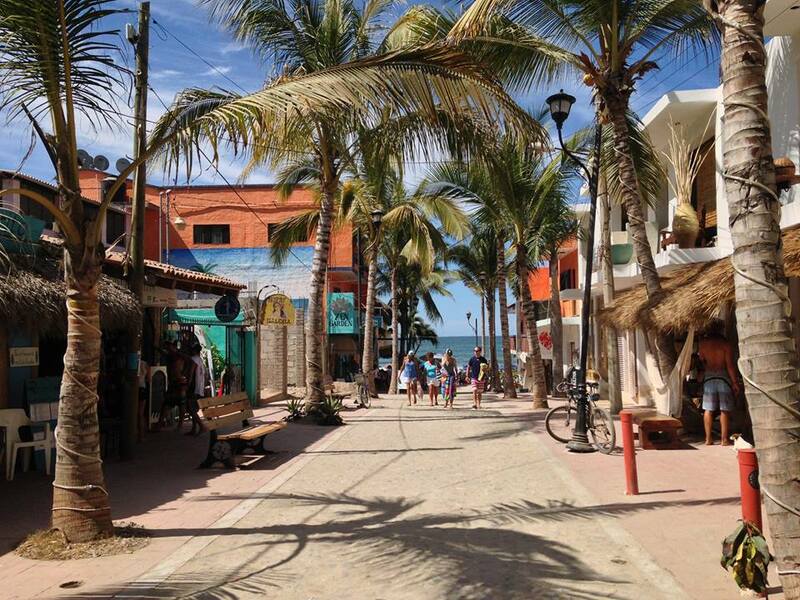 The 1.5 mile-long beach at Sayulita is U-shaped, ultra-wide and walkable. Right on the beach there are a series of palapa restaurants, as well as areas to rent surfboards and sign up for surfing lessons. Major annual events held in Sayulita include the Punta Sayulita Classic that features longboard and SUP surf contests as well as SUP races. This is one of the premier SUP events in North America, attracting thousands of spectators and world-class athletes. But surfers of all skill levels love Sayulita for its high-quality point surf and reef breaks, along with rental housing accommodations that are very affordable. Sayulita has a hostel, small hotels, condos, luxury rental villas, and stunningly beautiful boutique hotels such as Villa Amor. In addition to standard vehicles, favored modes of transportation around town are golf carts and ATVs. No extended holiday in Puerto Vallarta would be complete without a day trip to this hidden jewel of Nayarit. Sayulita is truly something very special.